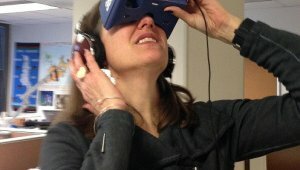 I will never forget the first time I watched Peace Corps’ first 360-degree video. Using a smart phone and a pair of headphones, I was instantly walking through a village in Zambia. I experienced firsthand what it felt like to be there. I was amazed. I am viewing the 360 video on a Google Cardboard viewer - which is fun, but not required. Viewers can be purchased for as little as $15. Once I got over my initial fascination, I had a realization. I was holding an extremely powerful global education tool in the palm of my hand. Any child, anywhere, could be magically transported to Zambia and be surrounded by the sights and sounds of a typical Zambian village. Not only does it give a realistic glimpse of life in a different culture and country, it allows access for students who may never had the opportunity. Peace Corps offers our video free of charge, addressing yet another barrier. While I acknowledge that not every school can afford tablets or smartphones for their students, viewing the 360° video only requires one device with wireless or cellular connection. It is certainly far more accessible than most other cross-cultural experiences. I invite educators to view our inaugural 360-degree video on Zambia. The video is best viewed on a smart phone or tablet with headphones in order to have the full experience. Keep in mind that the video allows a full 360-degree view, so be sure to turn the device in every direction to experience everything. For example, if you want to look at the sky, point your device to the ceiling. We will be launching several others throughout the year. Sign up for our email newsletter or follow us on Facebook or Twitter to be sure you are notified when Peace Corps launches future videos. programs that connect PCVs and RPCVs to classrooms in the United States, and provides a variety of resources to help educators integrate global issues and cultural awareness into the classroom.